By now, you probably think I’m obsessed with Star Wars. And, well, you’d be partially right. I’d hoped that my previous articles on the “holy grail” of the classic trilogy – the deleted scenes – would put the obsession to rest. The burnout had set in. What more was there to say about something more than 30 years old? Then I took my nephew to see The Phantom Menace in 3D. It probably says something that he was more interested in the comic book store I took him to afterwards (his first and he loved it; that’s what uncles are for when their nephews have football fans for parents). He’s very much into Batman and DC’s “New 52’s” Nightwing, but at a certain point, the Star Wars questions flew and I was there to field them. And there we get to the crux of it all: release the films with a visual gimmick at a time when the less expensive visual medium (but ultimately superior) Clone Wars cartoon is airing (and yes, Maul is coming back this week), and you’ve got the ultimate in storytelling branding and cross-pollination. You can repackage toys from 10 years ago, sell them for more than they sold a decade ago, and keep the cycle going. Farm moisture from vaporator, wash, rinse, repeat. But forgetting the cynicism that accompanies all franchises, there’s no denying that the past two seasons of Clone Wars are some of the best things produced by Lucasfilm since 1989, so why NOT remind us who Darth Maul is before bringing him back? The real question: is the 3D conversion of a 13-year-old “prequel” to a 35-year-old series worth it? Does it make sense to release the 3D incarnations in chronological order, rather than the way the world discovered them? And does it actually improve the film? There are three modern films I would recommend people see in 3D: Avatar, just because the visuals are astounding and still unmatched, IMHO (the story and dialogue are another matter altogether). Hugo, because it was a huge risk and payoff for Martin Scorsese that actually uses the genre integrally to its story and takes advantage of 3D with its camerawork in a way few films have, or probably will. 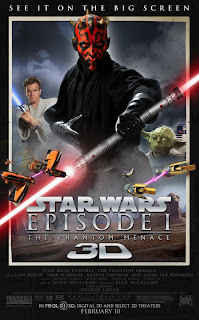 And I recommend The Phantom Menace, as an example of how post-conversion of “regular” films (i.e., those not meant for 3D) can be done right. Clash of the Titans? Poodoo. Pirates of the Caribbean? Go walk the plank. Lucas may not be good at dialogue, but he has an uncanny ability to make films that will last, no matter how they’re shown. Examples: The opening of the film. Probably the least scintillating opening of the six Star Wars films, but the camera sweeps, zooming ships, and lumbering Neimoidian blockade battlecrusiers (the rotating ball-shaped ships that look like proto-Death Stars with Saturn’s rings) work perfectly for the dimensional visuals, almost as if Lucas had anticipated doing this when he made the film (given that a Special Effects IMAX film from over a decade ago featured a recreation of the Star Wars “Star Destroyer” opener, it’s not surprising that he would have anticipated the expansion of the medium). Other standout visual examples include the lightsaber battle between Darth Maul and the duo of Qui-Gon Jinn and Obi-wan. Even the Gungan battle on the plains of Naboo works well, even if the faux-Chaplanesque “comedy” bungling of Jar Jar does not. The only let-down, visually, is ironically one of the few things touted as a highlight of the film—the Pod race. Maybe I’ve played “Podracer” too many times, or the 13-year old CGI graphics don’t translate well to 3D, but the Pod race (which was already bordering on excruciating in its length) suffers here and almost deflates the spectacle. Instead what works well, interestingly, is the dimensional layout of the characters in the quiet, talking scenes. Background details and characters jump to life. The characters have a new visual depth that almost makes up for the hollowness of their characterizations and words. And it’s always great to see a Star Wars film on the big screen. Even if you’re a prequel hater, there’s nothing like the communal applause when the logo appears and the soundtrack booms. In a theater. On a forty foot screen. With popcorn. The way it was meant to be seen. The film is still very slow, with few inspired character moments (the fact that I got more chacater analysis out of deleted scenes last time should say something). The best humor comes from Qui-Gon and Obi-Wan’s banter, and from C-3PO, who is superfluous to the story and underused. Ewan MacGregor amazes as the young, soon-to-be-older-and-wiser-than-his-years Obi-Wan, and there are moments when Natalie Portman’s natural sparkle and likability are able to transcend the wavering accent and overdone hairstyles and makeup. It’s always good to try to discern how the actions of Qui-Gon Jinn will play out in the end. The setup of the tragic events to follow, with Ian MacDiarmid’s slimy Palpatine (also one of the best things about the prequel series) and the Senate politics, are more interesting and allegorical in retrospect now then they seemed in 1999. And for continuity’s sake, one can see how the stilted dialogue of young Anakin becomes the even-worse drivel of teen Anakin. But for every reminder of how cool the storyline speculation was in 1999, one realizes now that the payoff in the remaining films (Attack of the Clones and Revenge of the Sith) opened up a greater number of disturbingly vague questions that never get resolved—at least, if you don’t read the tie-in comics and novels that have followed. And a film series shouldn’t have to do that. The Phantom Menace in 3D is ultimately a reminder of how Anakin’s road to the lava-drenched planet of Mustafar is paved with good intentions, but ultimately falls short of its goal. With the classic Star Wars trilogy, the viewer may have been left somewhat unsatisfied by the explanations that wrapped up the series, but these movies made some sort of logical sense. Here, the series opens up a journey that is resolved in a way that made most fans and critics satisfied and happy (though it took two more films to get there), but ultimately leave too many unanswered notions hanging to make any logical sense. You’ll also still cringe at Jar Jar, wince at “Are you an Angel?” and bemoan C-3Po’s random origin, but you’ll also be surprised at, in hindsight, how much it does work as setup to the other films, how genius the design of the Star Wars universe is, and of course, how cool it is to see a rotating proto-Death Star in 3D.